Forgot to discuss the Commando which is a whole different kettle of fish as far as British parallel twins go. Don't think you can really compare them to other Brit bikes. Rubber mounted engine makes all the difference even though engine is bored out to it's limit. My Commando vibrates like an SOB at idle (never seen an engine bounce around so much) and up to about 3000 rpm. Beyond that, the isolastics kick in and she's very smooth. Wouldn't hesitate to tour long distances on a Commando if I had an Interstate tank and low pipes to clear the side bags. The other favourite for the Domminator was the 'Morecome Flagelator' for reasons apparent to anyone who rode a wide line with a 650 lump in it. Reading these posts on early Triumphs and Guzzi's helps me appreciate my Hinkley Triumph America and my Moto Guzzi Nevada. Great improvements over the years. I remember my TR-6 fondly, but had a chance to ride one recently and was amazed at what we had to put up with in power, handling and braking back in the 60's. Jay Leno has a beautiful 62 Norton 650 SS . It's on you tube and well worth a watch . His comments are valid and says something for our obsession with bigger is better . What a machine ! When well fetted and properly set up they were great . Or just google Jay Leno 1962 Norton and it will come up . Would that have been Denny ? Wasn't it written somewhere "A Norton will get you there faster but a Guzzi will get you there sooner"? I ride a '97 Sport 1100i, and a '75 Norton Commando 850 Roadster. The Norton was dead smooth over 3000 rpm, but a paintshaker below that rev, UNTIL I overhauled the motor and very carefully set the Isolastics (rubber mounts and springs on the head-steady) to the factory specs. Made a tremendous difference, it is smooth from just off idle now. Gentle pulsations, but definitely not shaking bad. As some of you know, the Sporti with it's fuel injection and light flywheel vibrates pretty bad for a Guzzi. That is probably a little more pronounced due to the clip-on bars. When the vibration gets bad, I reset the TPS and sync the throttlebodies, and it calms down to a manageable level. Bottom line - the Norton is smoother - less vibration. But remember, this is a rubber mounted engine. Both are great fun to ride. I won't go into a comparison with my 6 cyl Gold Wing, since this thread is about the twins. When I rode a Ducati Darmah (which was smoother than either of the twins above) I traded rides with a friend who owned an 883 Sportster (pre rubber mounted). That thing had you spitting teeth and seeing double at any speed. He traded it in for a Gold Wing after a couple of months. Go figure. Beautiful! Faster than a 750cc or 850cc Commando as well. Would love to own one but prices are getting crazy. These are (were) the real old school chopper guys. They considered anyone with shock absorbers, electric start, a windshield, hell, even front brakes or fenders a puss. They ran cams, straight pipes, and apes. They never expected more than 20k miles from a rebuild. Most of those who are still alive today have moved on to 'Lectraglide baggers. Fun dudes. Until they got drunk in that bar next door and started shooting at each other ;) Seriously , Denny built some quick Triumphs and HDs . That "faster" thing is going to get people talking .... ! Problem is, what are the chances of getting a 750 Commando and a 650 SS on the same track at the same time so that the statement could be verified? In the meantime, I don't think so! Vibration, the 500cc Monza is smoother than the 500cc Ariel Red Hunter - but only really different above 45-50mph. 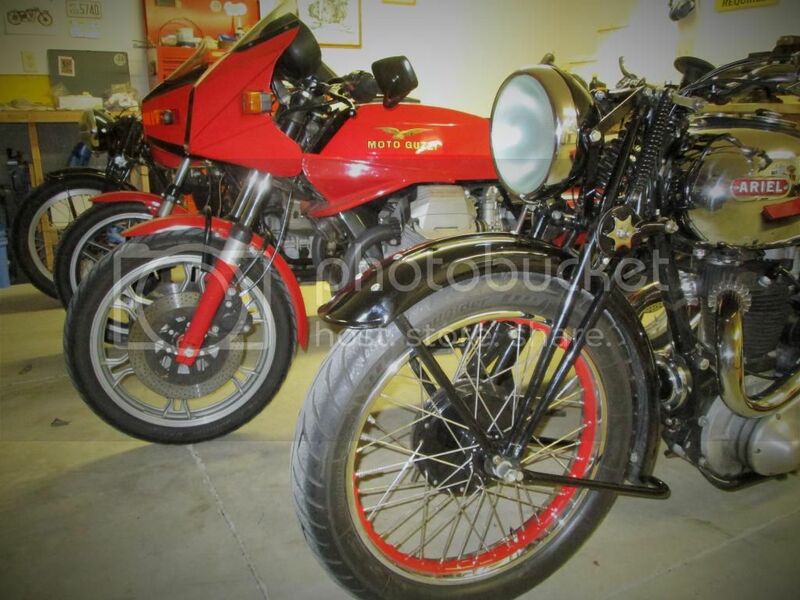 If we are talking corners, the Red Hunter is best under 25 mph and equal to the Monza up to about 40-50 where the fixed foot pegs of the Hunter start to scrub :o. The Monza is more comfortable to corner than the LMIII at any speed up to about 60 or so. Faster than that, the LMIII probably corners better, but mostly my sphincter tells me "No". Starting from a dead stop on a hill the Red Hunters are best. Accelerating out of a corner the LMIII is best. LMIII is the winner on the super slab. On loose gravel the Red Hunters beat the Guzzis except they have no air filters so try to avoid it. On bumpy roads the Monza is best if I can avoid most of them and the LMIII better if I gotta hit them. Three disks always beat two 7" drums in the emergency stop event. Parking on uneven ground or backing up is easiest with the Ariels followed by the Monza with the LMIII dead last. Getting on the stand it's Ariel, Monza and finally, with a 150lbs penalty, the LMIII. In the parking lot talk event it's '39 Ariel, '47 Ariel, Monza and LMIII (poor thing). Most top 100 roads (other thread) is '47 Ariel. In the leaving me stranded on the side of the road event - all are tied with perfect scores (though I've had to do a skosh of work once and a while 8)). I have to agree. The Dominator was pretty stout, but with everything else equal the Commando was good for about five more horsepower. A well tuned Norton 750 Commando moves along well for a Brit twin. I had a Commando bought used for a few years but never warmed up to the shaking below 3000 rpm or the handling. The Norton actually is more stable at high speeds but lacks the feedback of the Triumph. Then I bought a 4 year old Ducati 750 Bevel drive twin and was amazed how solid the bike was. My '82 900ss has the smoothest running ridged mounted engine I've ever owned. I've heard the 750's are smoother. Boy Rough, I am surprised you say the Commando is more stable than the Triumph. Unless my Nort is perfect with fresh tires, new shocks, and wheels alligned within a millimeter it becomes a white knuckle experience over 80. Anything can throw it off like a wind gust or small bump. For the record I have owned my '71 from new and have done all the tricks like minimising isolastic clearances and pinning the swingarm and beefier head steady. Also added a fork brace and steering damper. On the track on smooth pavement, no problems but on typical roads around here just keep it in double digits. If I want to go fast I get on the LeMans. That bike has never wavered. Sounds like your commando acts like mine (i've had mine since 1980), anything over 80 you are constantly waiting for the next wave or wobble. long sweeping corners at 100 mph are just plain scary. technically rubber mounting a swingarm is just plain stupid, even if you add lots of hardware to limit the sideways motion. i managed some 80.000 miles on the commando but needed two engines to do so. Two motors here too. I didn't know about the loose engine mounting studs and the left case eventually cracked on top. When I put in the second engine I reamed all the mounts the next size larger and installed ground studs. Still iffy at speed. Close to same mileage too. ODO reads 77K but many miles covered with a broken speedo cable. The later isolastic system , Mk something, supposedly cured some of the hinged-in-the-middle sensation that earlier Commandos suffered from . Not having ridden one in several years , can't remember if that is true . This issue could explain why the first 100 MPH lap at the IOM by a production bike was accomplished on a Triumph Bonneville instead of on a more powerful Commando . At a nicely-stocked and well-run used motorcycle shop a few years ago, a very pretty customized Ironhead Sportster caught my eye. Nicknamed by the staff "the bad penny," the salesperson quickly let me know that the bike was not for me: "We never have any trouble selling that bike, even though it keeps coming back. Nobody can stand riding it for very long." Must have been a great money-maker for the shop. "The transverse vibration is a great sensation -- hey, I think I just wrote a song!" "If Moto Guzzi were any more of a cult, you'd need a chicken." The later system has adjusters while the early system you had to shim. Easier to get right but still the same principle. It took me about 30 years of ownership to realize the swingarm is not centered in the frame. Center the wheel in the swingarm and its offset about 5/8" from the centerline of the frame. My Nort was a comfortable touring bike but never lived up to the "legendary" handling of its predecessors.